The name Encarta was created for Microsoft by an advertising agency and launched in 1993 as a $395 product, although it soon dropped to $99, and was often bundled into the price of a new computer purchase. In the late 1990s, Microsoft added content from Collier's Encyclopedia and New Merit Scholar's Encyclopedia from Macmillan into Encarta after purchasing them. Thus the final Microsoft Encarta can be considered the successor of the Funk and Wagnalls, Collier, and New Merit Scholar encyclopedias. None of these formerly successful encyclopedias remained in print for long after being merged into Encarta. Microsoft introduced several regional versions of Encarta translated into languages other than English. For example, the Brazilian Portuguese version was introduced in 1999 and suspended in 2002. The Spanish version was somewhat smaller than the English one, at 42,000 articles. In 2000, the full Encarta content became available on the World Wide Web to subscribers, with a subset available for free to anyone. In July 2006, Websters Multimedia, a Bellevue, Washington subsidiary of London-based Websters International Publishers, took over maintenance of Encarta from Microsoft. The last version was Encarta Premium 2009, released in August 2008. Microsoft announced in April 2009 that it would cease to sell Microsoft Student and all editions of Encarta Premium software products worldwide by June 2009, citing changes in the way people seek information, and in the traditional encyclopedia and reference material market, as the key reasons behind the termination. 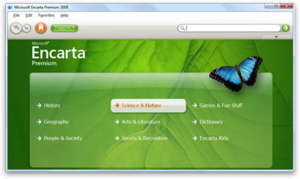 Updates for Encarta were offered until October 2009. Additionally, MSN Encarta web sites were discontinued around October 31, 2009, with the exception of Encarta Japan which was discontinued on December 31, 2009. Existing MSN Encarta Premium (part of MSN Premium) subscribers were refunded. The demise of Encarta was widely attributed to competition from the free and user-generated Wikipedia, which, from small beginnings in 2001, grew to be larger than Encarta, thanks to popularization by web search services like Google. By the time of the announcement of its closure in April 2009, Encarta had about 62,000 articles, most behind a paywall, while the English Wikipedia had over 2.8 million articles in open access. By the time of Encarta's closure in December 2009, the English Wikipedia had over 3.1 million articles. Encarta's standard edition included approximately 50,000 articles, with additional images, videos and sounds. The premium editions contained over 62,000 articles and other multimedia content, such as 25,000 pictures and illustrations, over 300 videos and animations, and an interactive atlas with 1.8 million locations. Its articles were integrated with multimedia content and could include links to websites selected by its editors. Encarta's articles in general were less lengthy and more summarized than the printed version of Encyclopædia Britannica or the online Wikipedia. Like most multimedia encyclopedias, Encarta's articles tended to provide an overview of the subject rather than an exhaustive coverage and can only be viewed one at a time. A sidebar could display alternative views, essays, journals or original materials relevant to the topic. For example, when reading about computers, it featured annals since 1967 of the computer industry. Encarta also supported closed captioning for the hearing impaired. A separate program, called Encarta Research Organizer was included in early versions for gathering and organizing information and constructing a Word document-based report. Later versions included Encarta Researcher, a browser plugin to organize information from Encarta articles and web pages into research projects. Content copied from Encarta was appended with a copyright boilerplate message after the selection. The user interface allowed for viewing content with only images, videos, sounds, animations, 360-degree views, virtual tours, charts and tables or only interactives. Encarta was originally available for sale on 1 to 5 CD-ROMs or a DVD. Some new PCs were shipped with an OEM edition of Encarta. Encarta 2000 and later had "Map Treks", which were tours of geographic features and concepts. Microsoft had a separate product known as Encarta Africana which was an encyclopedia of black history and culture. It was integrated into the standard Encarta Reference suite starting with the 2001 version. Encarta 2002 and onward feature 3D Virtual Tours of ancient structures, for example the Acropolis; 2D panoramic images of world wonders or major cities; and a virtual flight feature which allows users to fly a virtual airplane over a coarsely generated artificial landscape area. Version 2002 also introduced the ability to install the entire encyclopedia locally to the hard disk drive to prevent frequent swapping of discs. Encarta 2003 incorporated literature guides and book summaries, foreign language translation dictionaries, a Homework Center and Chart Maker. Encarta's Visual Browser, available since the 2004 version, presented a user with a list of related topics making them more discoverable. A collection of 32 Discovery Channel videos were also later added. Encarta 2005 introduced another program called Encarta Kids aimed at children to make learning fun. Encarta also included a trivia game called "MindMaze" (accessible through Ctrl+Z) in which the player explores a castle by answering questions whose answers can be found in the encyclopedia's articles. There was also a "Geography Quiz" and several other games and quizzes, some quizzes also in Encarta Kids. For years, Encarta came in three primary software editions: Standard, Premium, and Reference Library (price and features in that order). Beginning with Encarta 2006, however, when Websters Multimedia took over its maintenance, Encarta became a feature of Microsoft Student. Although it was possible to purchase only the Encarta encyclopedia separately, Microsoft Student bundles together Encarta Premium with Microsoft Math (a graphing-calculator program) and Learning Essentials, which provides templates for Microsoft Office. In addition, the Reference Library was discontinued, absorbed into a newer, more comprehensive Premium package. Encarta's user interface was shared with Microsoft Student, and was streamlined to reduce clutter with only a Search box which returned relevant results; however it became no longer possible to simply browse all the encyclopedia articles alphabetically. The dynamic maps were generated with the same engine that powered Microsoft MapPoint software. The map was a virtual globe that one could freely rotate and magnify to any location down to major streets for big cities. The globe had multiple surfaces displaying political boundaries, physical landmarks, historical maps and statistical information. One could selectively display statistical values on the globe surface or in a tabular form, different sized cities, various geological or man-made features and reference lines in a map. The maps contained hyperlinks to related articles ("Map Trek") and also supported a "Dynamic Sensor" that provides the latitude, longitude, place name, population and local time for any point on the globe. Encarta also generated a visible-light moon atlas with names of major craters and hyperlinks. However, it did not include a planetarium, but instead had a small interactive constellation-only map. In addition to database generated maps, many other illustrative maps in Encarta ("Historical Maps") were drawn by artists. Some more advanced maps were interactive: for example, the large African map for Africana could display information such as political boundaries or the distribution of African flora. When Encarta was released as part of the "Reference Suite" in 1998 to 2000, Microsoft bundled "Microsoft Bookshelf" with the other programs (Encarta Encyclopedia 98 Deluxe Edition, Encarta Desk Atlas, Encarta Virtual Globe 98, Encarta World English Dictionary, and Encarta Research Organizer). "Bookshelf" was discontinued in 2000, and in later Encarta editions (Encarta Suite 2000 and onward), "Bookshelf" was replaced with a dedicated Encarta Dictionary, a superset of its printed version, The Encarta World English Dictionary (later Encarta Webster's Dictionary). There was some controversy over the decision, since the dictionary lacks the other books provided in "Bookshelf" which many found to be a useful reference, such as Columbia Dictionary of Quotations (replaced with a quotations section in Encarta that links to relevant articles and people) and an Internet Directory (although many of the sites listed in offline directories no longer exist). Robert McHenry, while Editor-in-Chief of the Encyclopædia Britannica, criticized Encarta for differences in factual content between national versions of Encarta, accusing Microsoft of "pandering to local prejudices" instead of presenting subjects objectively. An article written by Bill Gates addressed the nature of writing encyclopedias for different regions. Before the emergence of the World Wide Web for information browsing, Microsoft recognized the importance of having an engine that supported a multimedia markup language, full text search, and extensibility using software objects. The hypertext display, hyperlinking and search software was created by a team of CD-ROM Division developers in the late 1980s who designed it as a generalized engine for uses as diverse as interactive help, document management systems and as ambitious as a multimedia encyclopedia. Encarta was able to use various Microsoft technologies because it was extensible with software components for displaying unique types of multimedia information. For example, a snap in map engine is adapted from its MapPoint software. The hypertext and search engine used by Encarta also powered Microsoft Bookshelf. Encarta used database technologies to generate much of its multimedia content. For example, Encarta generated each zoomable map from a global geographic information system database on demand. When a user used the copy and paste function of Microsoft Windows on Encarta on more than five words, Encarta automatically appended a copyright boilerplate message after the paste. Early in 2005, Gary Alt announced that the online Encarta started to allow users to suggest changes to existing articles. Encarta's content was accessible using a conversational interface on Windows Live Messenger via the MSN Bot "Encarta Instant Answers". The bot could answer many encyclopedia related questions directly in the IM window. It used short sentences from the Encarta website, and sometimes displays full articles in the Internet Explorer-based browser on the right. It also could complete simple mathematical and advanced algebra problems. This service was also available in German, Spanish, French and Japanese. Each summer (in the Northern hemisphere) or winter (in the Southern hemisphere), Microsoft published a new version of Encarta. However, despite the inclusion of news-related and some supplementary articles, Encarta's contents had not been changed substantially in its later years. Besides the yearly update, the installed offline copy could be updated over the Internet for a certain period for free depending on the edition. Some articles (usually about 2,000) were updated to reflect important changes or events. When the update period expired, an advertisement prompting to upgrade to the new version was displayed to the user occasionally. The editors of PC Gamer US nominated Microsoft Encarta '95 for their 1994 "Best Educational Product" award, although it lost to the CD-ROM adaptation of The Way Things Work. ^ For the free service, one should use the URL "Archived copy". Archived from the original on 2005-08-11. Retrieved 2006-01-07. CS1 maint: Archived copy as title (link) (MSN Search Encarta) rather than http://encarta.msn.com (MSN Encarta : Online Encyclopedia, Dictionary, Atlas, and Homework). Archived 2009-10-31. ^ a b "Encarta 2009 Information". Microsoft.com. Retrieved 2012-03-13. ^ a b c d Important Notice: MSN Encarta to be Discontinued (MSN Encarta). Archived 2009-10-31. ^ Protalinski, Emil (March 30, 2009). "Microsoft to kill Encarta later this year:Microsoft has announced that it is discontinuing its Encarta line of products. The software products will be gone by June 2009 and the website will go down October 31, 2009". Microsoft:News. Ars Technica. Retrieved 2009-04-08. ^ "Dictionary - MSN Encarta". 2011-08-17. Retrieved 2018-09-01. ^ "Interview with Jon Kertzer, director of Smithsonian Global Sound, for the Smithsonian Center for Folk Life and Cultural Heritage" (PDF). Archived from the original (PDF) on August 10, 2007. Retrieved 2009-08-24. ^ "Chronology of personal computers". Retrieved 2009-08-24. ^ "Chris Smith blog post at MSDN.com". Retrieved 2009-08-24. ^ Cohen, Noam (March 30, 2009). "Patrick, Graphic design intern on Version 1.0 of Encarta". The New York Times. Retrieved 2009-08-24. ^ Tom Corddry: "Encarta was not given away but sold at retail for about $100, and sold wholesale to PC manufacturers who bundled it with new machines." ^ "The Crisis at Encyclopædia Britannica" (PDF). Kellogg School of Management. Northwestern University. Retrieved 2008-08-05. ^ "Bem-vindo à Microsoft Brasil". Microsoft.com. Retrieved 2012-03-13. ^ "Websters International Publishers – Who We Are". Webstersmultimedia.com. Archived from the original on 2012-03-22. Retrieved 2012-03-13. ^ Gralla, Preston (March 31, 2009). "What Was Encarta? Look It Up on Wikipedia". PC World. Retrieved 2009-11-12. ^ McDougall, Paul (March 31, 2009). "Microsoft Encarta Is Web 2.0's Latest Victim". InformationWeek. Retrieved 2017-01-25. ^ Alderman, Naomi (7 April 2009). "Encarta's failure is no tragedy: Wikipedia has succeeded where Microsoft's Encarta failed, and seems to be a reversal of the 'tragedy of the commons'". London: The Guardian. Retrieved 29 April 2010. ^ "Microsoft Encarta Product Details". Microsoft.com. Retrieved 2012-03-13. ^ "Encarta 97 Adds Content, Extra CD". Microsoft Encarta Encyclopedia now comes in two versions: the award-winning Encarta 97 Encyclopedia on a single compact disc, and the new two-CD Encarta 97 Encyclopedia, Deluxe Edition. ^ "Microsoft Encarta Reference Library 2003 Takes the Work Out of Homework". The Encarta Reference Library 2003 five-disc CD-ROM and single-disk DVD have an estimated retail price** of $74.95 (U.S.) before a $10 (U.S.) mail-in rebate. ^ "Award-Winning Encarta Africana Included in Suite for the First Time". Microsoft.com. Archived from the original on 2011-06-04. Retrieved 2012-03-13. ^ ""The facts depend on where you are coming from"". Archived from the original on June 29, 2012. Retrieved 2004-09-13. CS1 maint: BOT: original-url status unknown (link), essay by Bill Gates reprinted in The Sunday Times of South Africa, April 6, 1997, archived in 2012 and accessed Jan 9 2014.